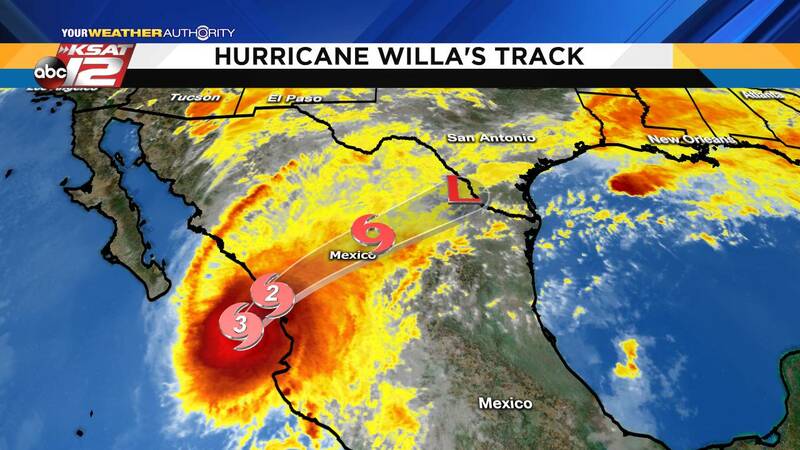 SAN ANTONIO - While we won't see hurricane-force winds and storm surge, Hurricane Willa will bring more moisture and heavy rain to South Central Texas on Wednesday. As of 1 p.m. Tuesday, Willa was a Category 3 major hurricane that promises to bring damage to Mexico's Pacific Coast. After moving onshore, Willa will fall apart as it treks across the Sierra Madre and become a remnant low, which will bring the threat for heavy rains Wednesday. We know that Texas can be affected by tropical systems in the Atlantic Basin, and more specifically, the Gulf of Mexico. But the Pacific? Is that unusual? Not necessarily, especially in October. As we all know, the weather in South Texas begins to change in October -- thanks to a deeper dip in the jet stream, which makes cold fronts and run-of-the-mill storms become more frequent. The jet stream allows for us to tap into ongoing Pacific tropical storms. Take for example the remnants of Hurricane Norma, just one of the many Pacific storms that have affected Texas in the past. This storm that hit Mexico south of Mazatlan eventually crossed the Rio Grande north of Del Rio and brought up to 25 inches of rain over three days to some parts of Texas. In North Texas, flooding at the Grayson County Zoo killed several animals. One elephant, Gerry, was swept away by the flood waters but survived by keeping his trunk above water for several hours. Rain will begin to increase late Tuesday and continue throughout Wednesday, thanks to Willa. Because of recent heavy rains, we'll have to monitor for the risk of river flooding -- especially along the Nueces and Llano Rivers in the Hill Country. Temperatures will remain in the 50s as a result of the cloud cover and rain. If you're itching for consistent sunshine, don't worry. We'll quickly clear out Thursday and sunshine and comfortable weather will last through the weekend.